Fueled by a combination of mushrooming LegalTech startups, an increasing interest from corporate legal departments, law firms looking into LegalTech strategies and most importantly, the legal media, LegalTech has come in the legal industry’s mainstream consciousness. Headline grabbing articles like “Machines are going to replace lawyers” or “Robo-lawyers are here to take your jobs” have become du jour. As an industry analyst, I set out to go beyond the buzz to explore the state of the global LegalTech market by gauging size, funding and corporate activities across different jurisdictions. In 2017, Catalyst, a growth equity venture capital firm estimated the LegalTech market is a $15.9 billion industry selling solutions to both corporate legal departments and law firms. Catalyst also estimated that uptake of LegalTech currently sits at about 20% in the legal industry. In other words, there is room to grow. 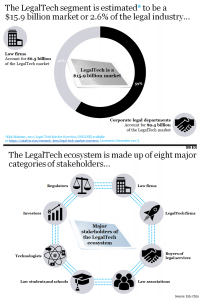 In my work in the LegalTech market, I have also found that the LegalTech market is driven by 8 major categories of stakeholders, each playing an important role in harnessing and growing the LegalTech ecosystem (see charts below). Who are those LegalTech firms? Where are these LegalTech firms based? What corporate activity have those LegalTech firms recorded from a funding and mergers & acquisition (M&A) perspective? Who are investing in LegalTech firms? Which segments of the LegalTech market have been most corporately active? The research was carried out at the end of February 2018 when the CodeX Techindex had 790 LegalTech firms listed and each entry was reviewed and then cross-referenced with Crunchbase, index.co and company websites. What came out of this research was 1,767 lines of data on Excel, exploring the global LegalTech ecosystem. This paper summarises some of the major findings from the research. As the LegalTech population is made up of a heterogeneous group of businesses, how do we identify LegalTech firms? Here is my answer – LegalTech firms are businesses that use technology arbitrage at the centre of their business model in the delivery of legal services. It is the business model that differentiates LegalTech firms from other solutions like law firms (expertise arbitrage) and NewLaw firms (labour arbitrage). The first manifestation for the need for legal services came in the form of law firms. For many years, when an organization had a legal need, it essentially had two choices. First, to turn to its corporate legal department and then when expertise were required, they turned to law firms. Therefore law firms have built a very successful business model around expertise arbitrage for corporate legal departments. All the major value chains within law firms are geared towards recruiting, training, retaining and billing based on expertise provided to corporate legal departments. It is only at the turn of the millennium that new solutions were conceived when the legal industry was engulfed by both outsourcing and technological waves. The outsourcing wave gave birth to NewLaw firms that provided lawyer secondment services and legal process outsourcing services. When I first introduced the term ‘NewLaw’ in 2013, it was originally used to categorise services like Axiom and Pangea3. In other words, NewLaw firms are businesses that use labour arbitrage at the centre of their business model in the delivery of legal services. The technological wave in the legal industry gave birth to LegalTech firms that provided technology solutions that improved lawyer efficiency and effectiveness. When technology first touched the legal profession, codified legal knowledge in the form of regulation, statutes and precedents were locked away in leather bound books in law libraries. Lexis (LexisNexis’ predecessor company) was founded in the 1970s and converted them into electronic forms, making it easier for legal research. Today, LegalTech solutions combine data analytics and machine learning to equip lawyers with relevant cases and probabilities of case outcomes (taking into consideration case parameters, the opposing counsel and presiding judges’ past judgements). The research and analysis reveals 692 out of the 790 entries on CodeX Techindex in February 2018 were verified LegalTech firms. Ninety-eight entries were culled because of double entry, some law firms and also incubation funds that made the CodeX Techindex. Of the 692, the LegalTech segment that has the biggest representation were legal document automation firms (184 firms), legal marketplace (153 firms) and legal practice management (138 firms). 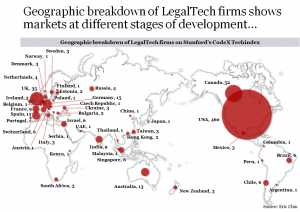 While the LegalTech segment with the smallest population is legal compliance, with 5 firms on the CodeX Techindex. What was surprising from the research is that the first CodeX LegalTech firm was founded in 1929. It was Bloomberg BNA’s predecessor company, the Bureau of National Affairs. 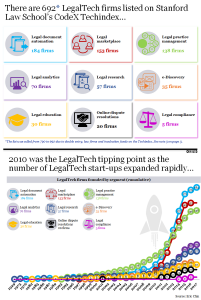 The analysis also reveals 2010 was the LegalTech startup tipping point as 84% of the LegalTech population on the Codex Techindex were founded from 2010 onwards. In addition, the countries with the largest number of CodeX LegalTech population were the US with 460, followed by Canada with 52, the UK with 35, Germany with 15 and Australia with 13 (see chart below). Using data from publicly available sources like Crunchbase and Index.co, I was also able to trace the type of funding deals recorded by CodeX LegalTech firms. Specifically, tracking LegalTech firms that recorded fund raisings from angel investment in early stage through to venture capital in growth stage and then M&A in mature stage of a typical startup’s financing lifecycle. I was able to trace $2.49 billion invested into 200 LegalTech firms from 419 funding rounds and 111 M&A deals recorded by 44 LegalTech firms (see below for the breakdown by segment). The LegalTech segments that attracted the most funding were legal practice management firms which raised a total of $897.8m through 105 funding deals, followed by legal document automation firms raising $772.8m through 128 funding rounds and e-Discovery firms raising $313m through 22 funding rounds. In addition, consolidation can be observed in the legal research segment of the LegalTech market as 7 firms recorded a combined 67 M&A deals, followed by legal practice management segment with 13 M&A deals and legal document automation segment with 12 M&A deals. Through the analysis, I was also able to breakdown the funding data by funding rounds and interestingly, most of the amount of funding was recorded during the venture capital round for LegalTech firms as $1.8 billion was raised through 152 funding deals. Unsurprisingly, most of the number of funding occurred for LegalTech firms during the seed funding rounds with 172 funding deals while the amount raised is about ten times lower than the amount raised from venture capital rounds, with $152m. The analysis also revealed on average, funding deals for LegalTech firms occur about 3 years after commencement. 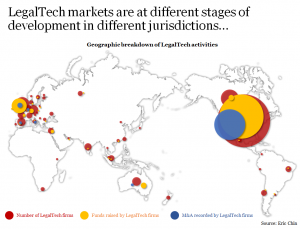 This research and analysis sheds light on the global LegalTech market by gauging CodeX LegalTech firms’ funding and M&A activities across different jurisdictions. Conclusively, all markets are at different stages of development (see chart below). There are markets like Europe and Australia that are driven by a grassroots movement of LegalTech firms coming together to form the European Legal Technology Association and the Australian Legal Technology Association respectively. Then there are markets like Singapore where the regulator is implementing a plan to build the city state into the Asian LegalTech hub. The Future of Law Innovation Program by the Singapore Academy of Law is an example. While the data from this research has painted a picture of the global LegalTech market, it is not a complete view. As the late Hans Rosling once observed “the world cannot be understood without numbers. But the world cannot be understood with numbers alone”. The realities for LegalTech companies is that there is still a long way to go for an industry that is estimated at 20% LegalTech uptake. Thank you for taking the time to read this paper. Feel free to reach out to me via LinkedIn or Twitter if you’re interested in getting a copy of the report. This post was written by Eric Chin, consultant to LegalTech, NewLaw, BigLaw and Big Four firms on strategy, M&A and Asia. Editor’s Note: This article is published with permission of the author with first publication on LinkedIn.